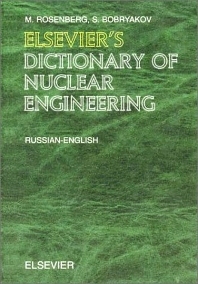 The English-Russian volume contains about 50,000 terms covering various fields and subfields of nuclear engineering and technology: nuclear physics, thermonuclear research, nuclear reactors, nuclear fuel, isotopes, radiation, reliability and safety issues, environmental protection, emergency issues, radiation hazards. Terms from the military nuclear field are also included, as well as the names of nuclear power plants and nuclear societies worldwide. It also contains a comprehensive section of about 6,500 abbreviations..